Consistently managing environmental issues for a heavy manufacturing enterprise across more than 30 manufacturing plants, including 13 iron foundries, in North America and internationally is a complex task. Recognizing these challenges, McWane has in place a well-designed and centrally coordinated Environmental Management System (EMS), which is part of a comprehensive EHS Management System. Our EMS is based upon the principles of ISO 14001 (an international standard for environmental management systems) and EPA’s Compliance Focused EMS. The EMS provides all McWane facilities with an infrastructure for identifying significant environmental issues, setting measurable goals and establishing and coordinating consistent management practices for all environmental activities, including record keeping and reporting. The foundation of the EMS is the company’s EHS policy. McWane has issued various directives that address the various aspects of EHS management, including: compliance; management commitment and leadership; roles, responsibilities and accountability; personnel and training; information systems and documentation; hazard assessment, prevention and control; management of change; significant matters reporting and investigation; goals and objectives; management review; emergency preparedness and response; contractor management; pollution prevention; employee involvement; community outreach; managerial employee performance evaluation; communication; and records and document control. 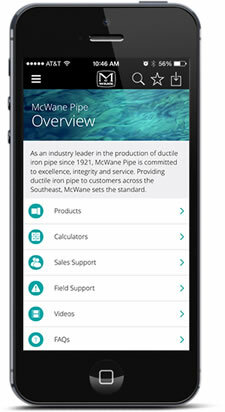 To make these program elements accessible and functional, McWane has invested in state-of-the-art information technology systems. At the core is the EHS Management System website. Its dashboard feature allows users to quickly and easily access information company-wide and link to other electronic web-based tools such as OpsInfo, Dakota Tracer, and Dakota Scout. OpsInfo is a comprehensive web-based software system for electronic management, tracking, trending, analysis and reporting of environmental data and information. The web-based Dakota Tracer and Scout systems allow our company to track corrective actions until they are satisfactorily resolved and document any environmental events/incidents.